Blue Nile Signature Ideal Diamonds Review - Are They Worth Going For? To produce a diamond with a truly excellent cut much more rough is lost in the process of cutting a diamond. And indeed, the better the cut the more brilliance, sparkle and fire a diamond will exhibit! Read on to find out why the signature ideal diamonds are not a guarantee for an outstanding cut, however! What strikes the eye is that Blue Nile has very strict standards for the depth and table percentages! The depth and table percentages suggested by me are already stricter than the GIA or AGS proportions required for the best cut grade. Still, Blue Nile’s standards are even stricter! One should therefore think that Blue Nile signature ideal diamonds have the best cut ever! However, one must bear in mind that Blue Nile does not have any requirements whatsoever for the crown angle and the pavilion angle! The exact proportions of these angles are very important for the light performance of a diamond, though. They determine how well the light is returned within the diamond to the viewer’s eye. Decades ago people believed that only the table and depth percentages are important. However, nowadays it is generally known that this is not true! I won’t be lying – there are absolute blockbusters within the Blue Nile’s signature line! Many of Blue Nile’s signature diamonds look stunning and have good Holloway Cut Advisor scores. 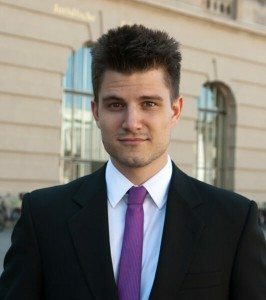 Please read my post on the Holloway Cut Advisor Tool if you want to know how the Holloway Cut Advisor works. What I find somewhat confusing is that sometimes you can see previews of the actual diamond if you click on the diamond. But more often, you cannot see a preview and will have to click on the GCAL report to get to see the two tiny pictures of the diamond. Now, the striking thing is that all the preview photos with the actual diamond look absolutely stunning! Whereas the diamonds with previews of sample diamonds usually look okay or good but not that utterly amazing. 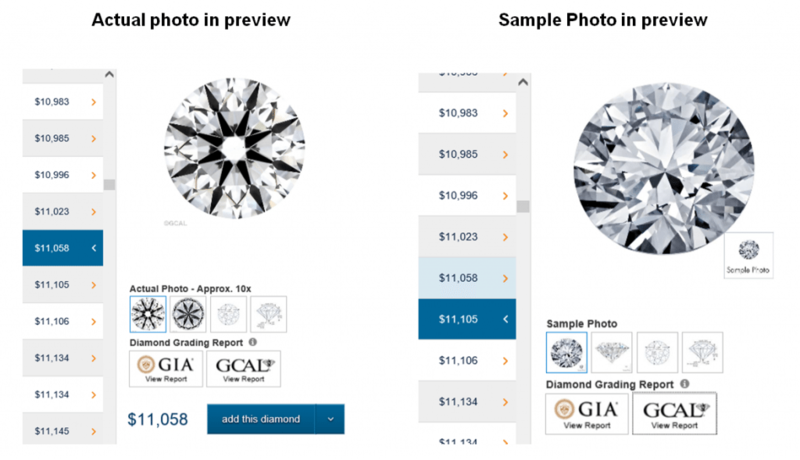 It somehow leaves the impression that Blue Nile is trying to hide the photos of its okay to good diamonds from the customer and hopes that its customers will buy the diamond blindly. Somehow, it does not make me feel as though Blue Nile is promoting 100% of transparency for the customer. Sometimes you even find pretty bad diamond choices within the Blue Nile signature line and this is usually due to subpar crown or pavilion angles. As I have mentioned before, Blue Nile does not pay any attention to the specific degree of crown or pavilion angels. The pavilion angle of this diamond is 41.4 ° whereas actually it should never be bigger than 41 °! For people who are not well acquainted with diamond proportions this might seem completely negligible. However, seemingly minute changes in the crown or pavilion angle can completely change the way how the light is reflected back to the viewer’s eye and thus lessen a diamond’s brilliance, fire and scintillation. If we type in this diamond’s proportions into the Holloway Cut Advisor we receive a score of 4.7! The Holloway Cut Advisor is a very useful tool for sorting out low performing diamonds. Any diamond with a score above 2 should not be taken into further consideration. Now, 4.7 points is quite a bad score for a diamond that is supposed to have a superb cut! This diamond with its 3.38 carats is huge. Still, it costs $64,410 and I would not possibly recommend it to anyone! Don’t get me wrong: There are superb diamonds to be found within Blue Nile’s signature ideal series! But the fact that a diamond is a Blue Nile signature diamond does not necessarily mean that it is going to be a diamond of superb quality. Thus, you will still have to look very closely at each diamond offered by Blue Nile to get a diamond with a truly outstanding cut. A really great place to get high quality diamonds for a reasonable price is James Allen with their signature True Hearts diamonds. The fact that you can view all diamonds in high definition 360° videos in up to 40x magnification makes all the difference! You don't have to hope that your diamond will look great but you can actually verify it before buying the diamond! Another awesome place where you can be sure to get a diamond with an excellent cut – no matter what – is Brian Gavin. It is an online vendor that is specialized in only offering diamonds with the best possible cut. All diamonds are handpicked by the owner, Brian Gavin himself who is a 5th generation diamond cutter and diamond cut perfectionist. Read my full Brian Gavin Diamonds Review to find out more. Now, apart from the two pictures provided for signature diamonds by the GCAL report there are several additional data to be found. For one thing there is the optical brilliance analysis and the so-called optical symmetry analysis. Beneath you see two different Blue Nile signature ideal diamonds and their optical brilliance analysis compared to each other. 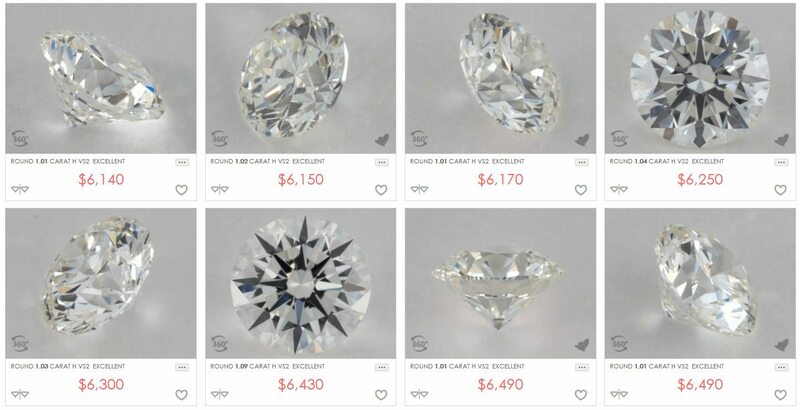 On the left side you see the optical brilliance analysis of the diamond we have just looked at: The one with the really bad HCA tool score of 4.7 points and another random diamond I have chosen from within the signature line. The white areas represent areas of light return whereas the dark-blue areas represent areas of light loss. Thus, the whiter the entire analysis photo the more brilliance, fire and scintillation the stone will exhibit. In this case it seems pretty apparent that the left stone would be the worse choice as there are quite some areas of light loss. Furthermore the GCAL report also provides for an optical symmetry analysis. This analysis is taken in a particular lighting environment which shows in which ways the light is returned. The light that is returned at the same angles has the same color. Thus for instance, all green areas represent the light that gets returned within a consistent angle range. Thus, the more even the pattern, the better the symmetry. I find this analysis rather dispensable, though. A Good diamond symmetry enhances a diamond’s amount of light return. But this is something you can already deduce from the optical brilliance analysis. Furthermore, for a brilliant light return the diamond proportions themselves are much more important than the diamond symmetry. Also, please don’t confuse GCAL’s optical symmetry analysis with an ASET or Idealscope analysis. It is something completely different. On the next page I will dive deeper into Blue Nile’s conditions of purchase and its overall customer service. I will use this opportunity to compare Blue Nile to James Allen in order to draw a final conclusion.